Mizithra or myzithra (Greek: μυζήθρα [miˈziθra]) is a fresh cheese made with milk and whey from sheep or goats, or both. The ratio of milk to whey usually is 7 to 3. 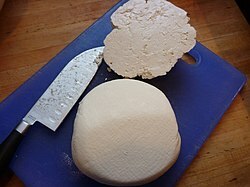 Production resembles that of Italian ricotta. Furthermore, Mizithra can be salt-dried to produce a mature salty cheese similar to the Italian ricotta salata.